University of Texas Rio Grande Valley professor Joanne E. Curran at the South Texas Diabetes and Obesity Institute stands inside the Luis V. Colom Building in Brownsville at one of their research labs Tuesday. UTRGV School of Medicine has received a four year 2.36 million grant from the National Institutes of Health's National Heart, Lung, and Blood Institute to study the relationship between human lipid variation and cardiovascular disease. 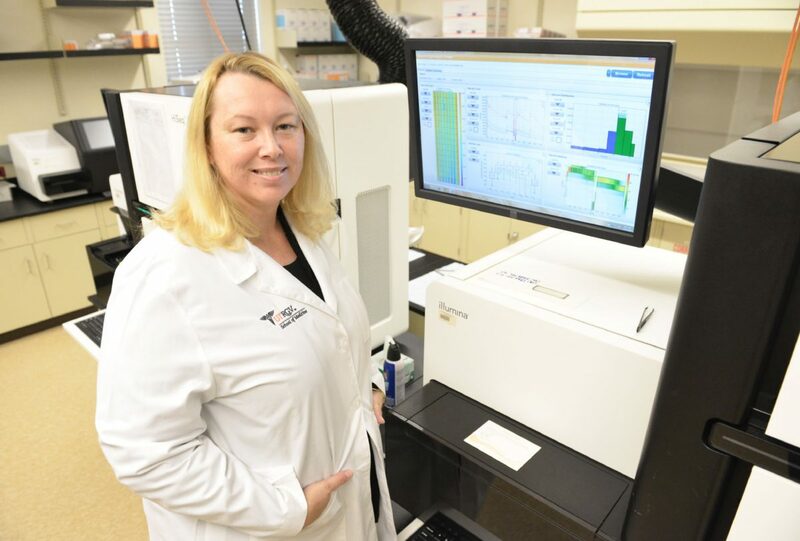 A researcher at the University of Texas Rio Grande Valley won a nearly $2.4 million, four-year grant to study how lipid levels and individual genetic makeup can lead to heart disease among Mexican-American patients. Joanne Curran, a professor in the South Texas Diabetes and Obesity Institute and the department of human genetics at the UTRGV School of Medicine, said identifying how lipids and genetics play a role in cardiovascular disease can lead to earlier treatment for heart disease patients and the development of new medications. She is collaborating with a researcher from the Baker Heart and Diabetes Institute in Australia on the study. The National Institutes of Health awarded the grant. “The Hispanic population is the fastest growing in the U.S., so we need to understand health in that population,” Curran said. John Krouse, dean of the UTRGV School of Medicine and vice president of Health Affairs at UTRGV, said the study will have local benefits because cardiovascular disease risk factors like diabetes and obesity are prevalent in the area. A third risk factor is elevated levels of lipids, like cholesterol and triglycerides, which can build up and cause narrowing of arteries. The World Health Organization named heart disease and stroke as the two leading causes of death across the globe in 2015. Krouse said gone are the days when it could be assumed that a medicine or treatment would be equally effective among all patient groups. In the era of “precision medicine,” genetic differences between populations can be used to determine the best course of treatment. Curran will look at changes over time in the lipid levels of 500 research participants and the impact those changes have on cardiovascular disease. Eventually, the study will expand to 1,200 participants. The blood samples researchers are analyzing come from a pool of participants who have been tracked as far back as 1991. While the samples are collected in San Antonio, Curran said participant families members have traveled up from the Rio GrandeValley and Mexico to join. Being able to study blood samples from families of participants is important, Curran said, because it enables researchers to observe the role heredity plays in diseases.